Built in the style of the thirteenth century this impressive building was the largest Non-conformist place of worship in the town. Completed in 1865 by the Wesleyans its church like appearance was popular with middle class chapel goers. However the design was controversial to the point that separate funds were set up so that those who objected to the spire could contribute without troubling their consciences! Some of the cost was met by William Mewburn of Wykham Park who had become wealthy through railway stocks. He also gave financial help to other free churches within the town. When his daughter married here in 1871 the whole street outside was decorated and the guests arrived in coaches pulled by nine pairs of grey horses. The complex also consisted of a ministers house and a church hall and rooms which have since been demolished. The Salvation Army first appeared in Banbury in 1880 when their services, held in the Central Corn Exchange, created much furore. Their accusation that, half the towns population never go to a place of worship and three quarters have one foot in hell provoked such disorder that they were obliged to leave town! A permanent presence was established in 1888 and by 1904 work had begun on their headquarters in George Street. The suburb of Newland was laid out around 1285 on land belonging to the Abbot of Eynsham however it was not until 1853 that a church was opened here to better meet the wants of the poor.The church which was consecrated in 1853 by the famous Bishop of Oxford Soapy Sam, the Right Reverend Samuel Wilberforce stood on the corner of George Street and Broad Street. The planned tower was not added until 1880 and the proposed spire was never completed. The church was declared redundant in 1967 and demolished however, the surviving school rooms across the road give some idea of the appearance of this splendid building. In 1831 Caleb Clarke, a Baptist from Northamptonshire settled in the town and began a ministry of preaching and healing in his own house. 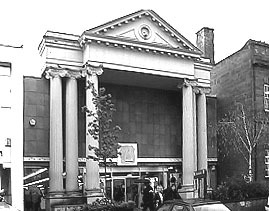 In 1840 his congregation formed with others the new Particular Baptist Church and work began on this Greek Revival chapel in Bridge Street which opened in 1841. 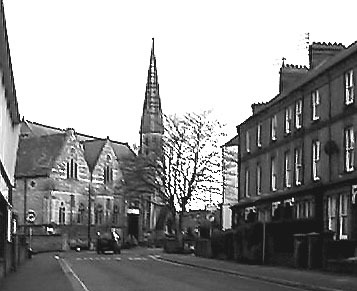 The chapel flourished and one of its supporters was James Gardner an engineer whose invention of a turnip cutter played a major part in the towns industrial development. 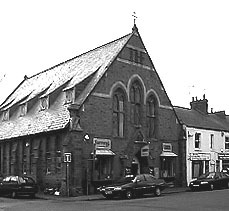 The chapel closed early in the 1970s when the congregation moved to new premises..